Small city mayors: Build your tech hardware in the U.S. This story originally appeared on CNET. Bill Harrison has a simple idea: have the machines and gadgets of the future built closer to home rather than in places as far-flung as China. As the mayor of Fremont, California, a city about 40 miles south of San Francisco, Harrison isn't just talking about his idea. He's started a campaign he hopes will show tech innovators in Silicon Valley that the products they imagine here can can also be built here. Harrison's East Bay city, which measures 88 square miles, is already home to the manufacturing center for electric-car maker Tesla. The auto plant, all 5.5 million square feet of it, was previously used by a joint venture between Toyota and General Motors and churns out cars like the popular Tesla Model S.
Fremont has been trying to lure other manufacturers there through a campaign called "Think Silicon Valley" and has dubbed itself "Silicon Valley East." 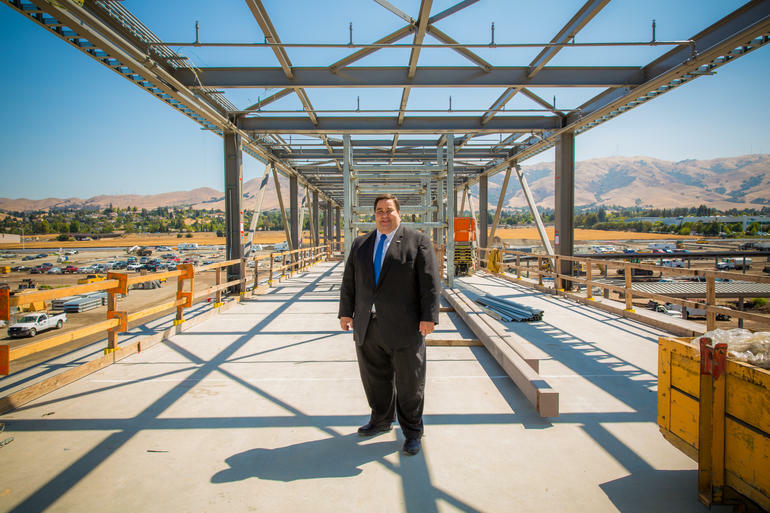 "We're building the workforce for the 21st century," Harrison said on a phone call after stepping off of BART, the commuter train that connects Fremont to San Francisco and the rest of the Bay Area. Silicon Valley got its name from the chip manufacturing companies -- from Fairchild Semiconductor to Intel -- that established the silicon-based chip industry in California starting in the 1950s. But Harrison, pointing to Tesla and other companies working on everything from battery tech to solar panels in Fremont, thinks there's more manufacturing opportunity to be tapped. "We've built on that success and brought other products here," he said. In the past decade, some of Silicon Valley's biggest names -- Google, Yahoo and Facebook, for instance -- have been services-based companies. But tech hardware products have come back into vogue as costs have come down and crowdfunding sites like Kickstarter have made it easier for smaller players to set up shop. They're creating everything from wearable devices like smartwatches to virtual reality goggles. Manufacturing in America has risen in year over year, according to the National Association of Manufacturers. U.S. manufacturers contributed $2.08 trillion to the nation's economy in 2013, up from $2.03 trillion the year before. And more than half of the 200 U.S. companies with sales greater than $1 billion will be moving jobs back to the country within the next two years, according to the Boston Consulting Group. To be sure, Asian manufacturing isn't going anywhere. Foxconn, an Apple partner in China, is reportedly hiring to meet demand for Apple's new iPhone 6 and 6 Plus, which are manufactured exclusively at its facilities there. Still, growth in China's manufacturing economy stalled in September, according to a report Wednesday by the National Bureau of Statistics. And 92 percent of U.S. manufacturers believe the cost of China labor will increase, while 72 percent found building in China to be "more costly than anticipated," noted the Boston Consulting Group. If there's one symbol for advanced tech manufacturing in the U.S., leaders from Nevada would like it to be the soon-to-be other Tesla factory -- a battery-pack plant of up to 10 million square feet that's nicknamed the Gigafactory and is slated to be finished in 2017 outside Reno. Tesla CEO Elon Musk has been touting the size and scale of the Gigafactory: "If you add up all of the lithium ion [battery] factories in China, Korea, Japan, elsewhere in the world, and you sum them all up -- all of their production capabilities that year -- the Gigafactory is actually bigger than that," Musk said last month, during an announcement in Carson City, the state's capitol. The Gigafactory will officially reside in Sparks, a small city about 5 miles east of Reno. Nevada Governor Brian Sandoval has cheered on the economic benefits of the site, despite a massive $1.25 billion incentive package for Tesla. Sandoval notes the creation of 3,000 immediate construction jobs and 6,500 manufacturing jobs once the factory is built. Neither Sandoval's office nor the office of Sparks Mayor Geno Martini replied to requests for comment. But surrounding cities also hope it will lift up the entire region. "At the top line, it will hopefully change the brand of Nevada -- and particularly Northern Nevada -- in tech manufacturing," said Bob Crowell, mayor of Carson City. Crowell would like the factory to serve as an anchor for other companies, and he's hoping other firms will settle in Carson's manufacturing plant near its airport. So far, Tesla's factory is having the desired halo effect. The plant has sparked a 10 percent jump in real estate prices around its future site, guaccording to a report by Reno-based Miller Industrial Properties. "The most immediate effect of the Tesla news has been the burst of nationwide interest from the real estate investment community," the report said. Though a large company can be an economic boost for a small city, Harrison is quick to list the perks for the company and its employees. Chief among them: cheaper rent. The median price to rent an apartment is $2,300 in Fremont, according to Zillow. In San Francisco, it is $3,600. But while hardware manufacturing has been most popular in Fremont -- disk-drive maker Seagate announced last year it was taking over the failed clean-tech firm Solyndra's plant in the city -- Harrison is hoping for a tech diaspora of all sorts. "A lot of Facebook employees live here," Harrison said. The social network's headquarters are a short drive across the 1.6-mile Dumbarton Bridge to Menlo Park, Calif. "We want the next Facebook to come here."